I must confess that I now have old guy eyes. Meaning that I have a hard time seeing small things close up and end up moving them back and forth like a trombone to get them into focus. I picked up my first Ty-Rite at Abe's fly shop on the San Juan River in New Mexico. If you have ever fished the San Juan you probably know that, in addition to the famous worm fly, many fish are caught on teeny tiny midges. By teeny tiny I mean around a size 28. I quickly discovered that I had a couple of serious problems dealing with these small flies, holding them and tying them on to my leader. The Ty-Rite resembles a ball point pen. However when you press the button that would normally push the roller ball tip out of the pen, you get a tiny hook. 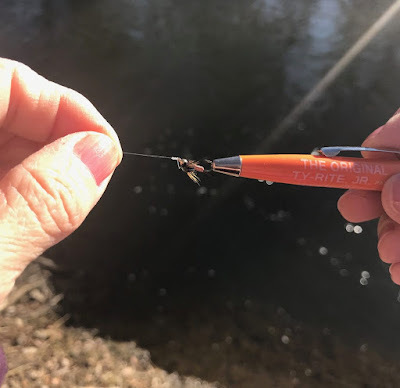 Place the hook around the bend of a fly and release the button and you have a firm grip on the tiniest of small flies. You can then proceed to thread the fly on the leader and even use it to help tie a cinch knot with relative ease. To cut to the chase, If you have old guy eyes like me you need one of these on your fishing vest. Get one of your own via our Amazon Influencer page . (ps. we may earn a teeny tiny commission on affiliate purchases but don't let that stop you from getting one.). Thanks for the great review! We are striving to bring The Original Ty-Rite back to its glory & reviews like this are showcasing our made in America quality & customer service! Don't settle for the imitation!